Neuerfindung (Reinvention) – Gordon Huether’s German immigrant father Hubert made his living as a window display artist. Hubert began working for Carither’s department store in downtown Napa in the 1960s. While he did not have formal art training, he clearly had a gift for design. He created displays which were bold and dynamic, somewhat shocking for their day. Gordon’s early foundation in composition comes from helping his father work on the windows and discussing what did and didn’t work. After the death of his father in 1987, Gordon inherited a portfolio of photographs documenting many of Hubert’s window displays. Years later, a friend surprised Gordon with the gift of mannequins formerly used by Hubert in his window displays. 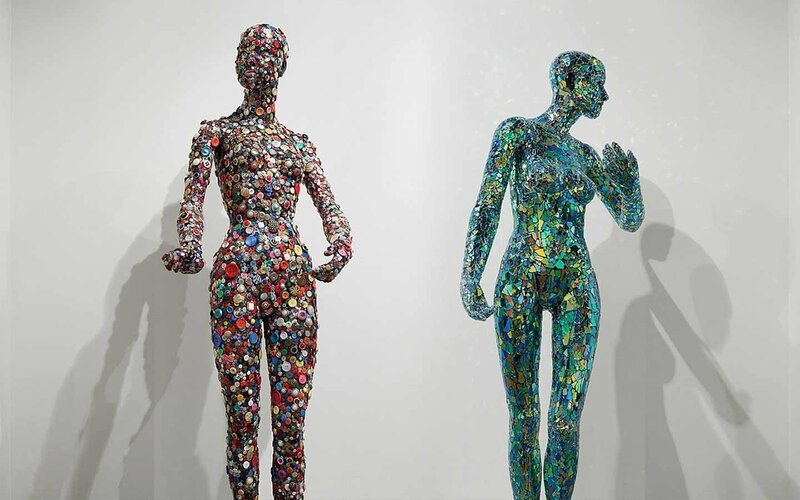 Gordon then decided to use Hubert’s images and mannequins to create Neuerfindung, a work that would combine his interest in repurposed materials with narrating a more personal history. 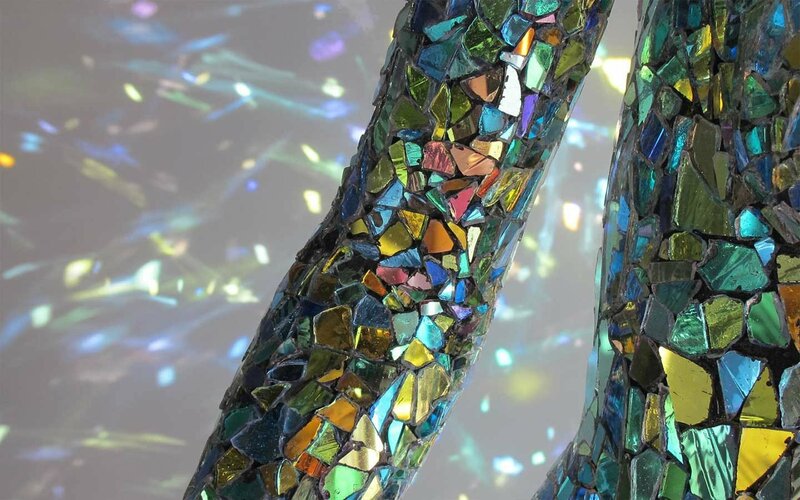 For Neuerfindung, one mannequin is covered in a mosaic of shattered dichroic glass, which can be seen as a metaphor for the fate of the Huether family, shattered in succeeding generations by divorce. 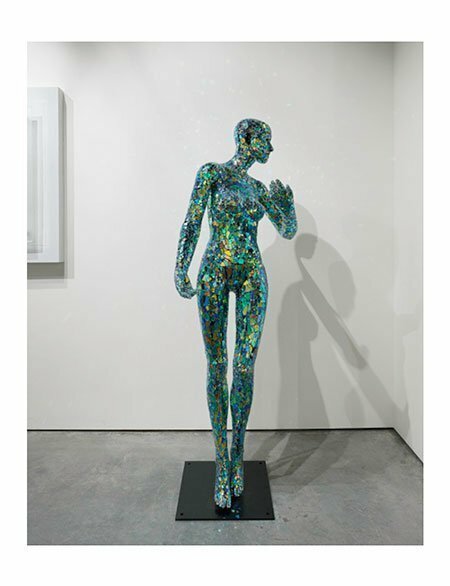 The dichroic glass mannequin was placed before an image entitled ‘Not Since Eve’, featuring a quirky combination in which an underwear mannequin intertwines with sinuous tree branches and a giant, disturbingly phallic serpent. 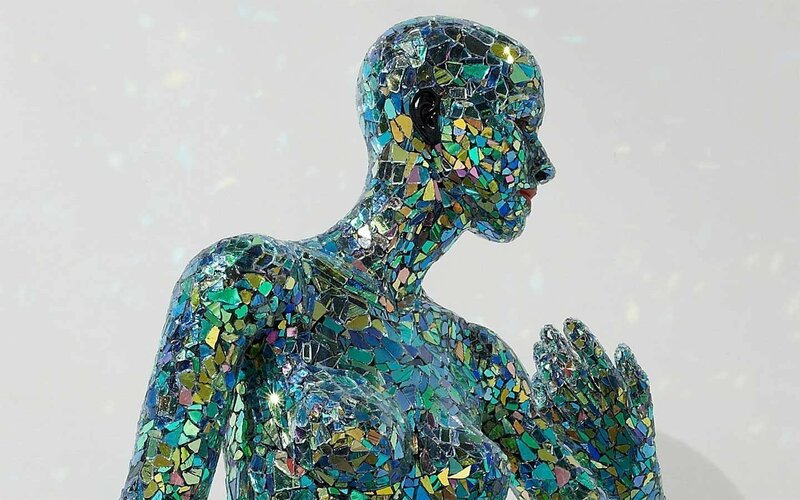 Gordon’s daughter Erika, also an artist, fabricated this intricate glass mosaic mannequin, making this installation a three-generation endeavor. In the opposing window, a second mannequin is encased in buttons. The repurposed buttons are used here to evoke remembrance of the many people whose hands have been placed on them. This mannequin was then juxtaposed with an image entitled ‘Woman with Purse’, featuring a stylishly dressed female mannequin at risk of being splattered by a can of paint. Objects and images originally meant for commerce have been reinvented to create a work of art meant to aid in the revitalization of Downtown Napa. 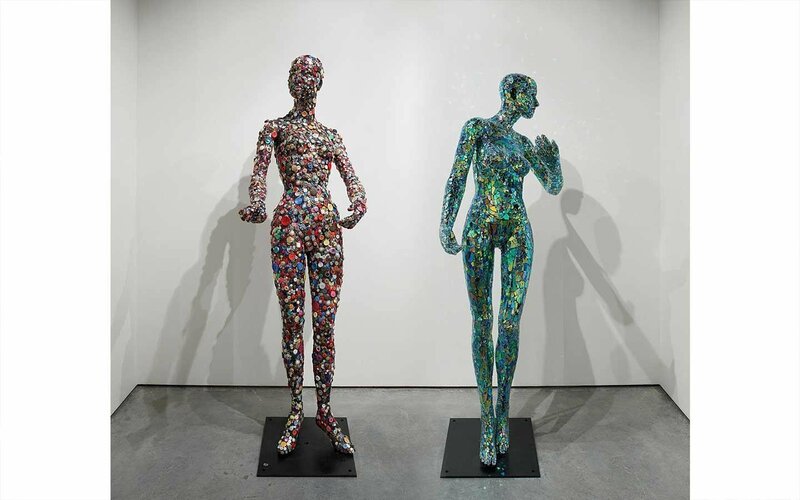 Neuerfindung is filled with layers of meaning about multi-generational connections and the simultaneous reinvention of Hubert’s work and Downtown Napa.